Barum Bravuris 2 tires not only provide high performance and balanced handling, but do it for a fraction of the price you would pay for similar models from larger brand name tire makers. As a division of Continental, Barum has produced a solid option for high performance summer driving tires. The asymmetrical tread pattern features additional tread blocks on the inner side of the tire, which increase handling and traction on wet roads and reduce the risk of hydroplaning, giving you added confidence behind the wheel. A computer optimized tread block design provides more grip on dry roads, as well as shorter braking distances. The unique tread compound for the Bravuris 2 is designed to prolong the life of the tire, and make it a more quiet and comfortable as well. Overall, this Barum tire may surprise a lot of drivers with its performance. It’s a good, not great, tire that will save you substantial money and give you more than adequate performance. Prices on the Bravuris II range from around $69 for the 14 inch series to approximately $139 for the bigger 20 inch series tire. Who Are Barum Bravuris 2 Tires Designed For? Barum Tires has developed the Bravuris 2 for drivers of sports cars, coupes and sedans who are looking for serious handling and performance without having to pay the high prices you would with other major brands. Barum Tires backs the Bravuris 2 tire with a 45,000 mile treadlife warranty. 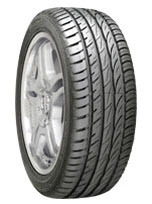 You’ll also find a 2/32 inch tire uniformity guarantee, as well as protection on materials and workmanship. You can find more on the Discount Tire website.